We all need a PROVEN marketing system that repeatedly generates leads and participants. Funnily enough, that’s exactly what my team at Make Sport Fun designed for our clients who work in physical activity. … so you can put it to work immediately. That’s really the best part – even though, as an agency, Make Sport Fun caters to public sector clients (and have applied this strategy to over 100 of them) the fact is this system can be applied by ANY physical activity provider not just public sector but also gyms, personal trainers, fitness studios and so on. After years of testing (with plenty of trial and error), this 2-step process has proven time and time again that it’ll just plain work to connect with your target audience! We’ll start with the results and then explain how you can use this method in the work you do. Within the first 7 days of launching we generated 81 leads. 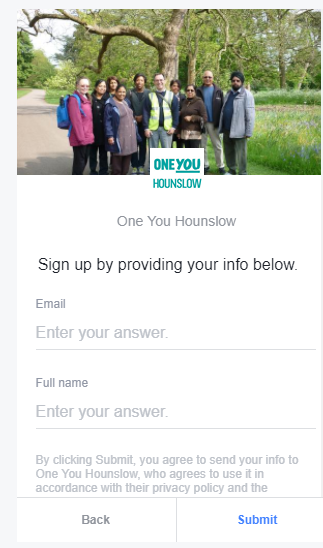 …indicating that they want to get more details about walking opportunities in Hounslow. Of those 1115 leads, 14% of people downloaded the Active 10 app. The average conversion rate on app store in the Health and Fitness category is 18.5%. These 1115 people were solely from the marketing campaign – this doesn’t include referrals those leads provided. “The Active 10 campaign is an important element of our approach to tackling inactivity. 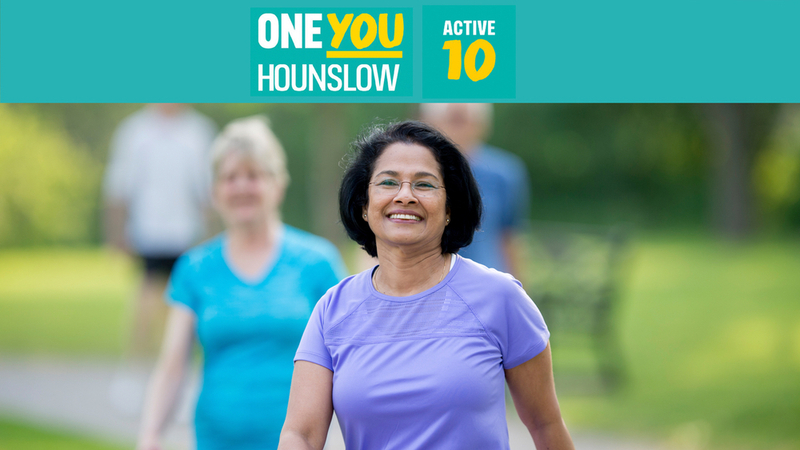 It’s about making it easy for Hounslow residents to take the first steps to becoming more active. The Facebook campaign enabled us to reach hundreds of residents within our target group and motivated them to sign up. The Make Sport Fun team created a range of targeted ads and continually tested and optimised them throughout the campaign. These were then linked with a bespoke series of emails designed to motivate and support people to access local walking opportunities. 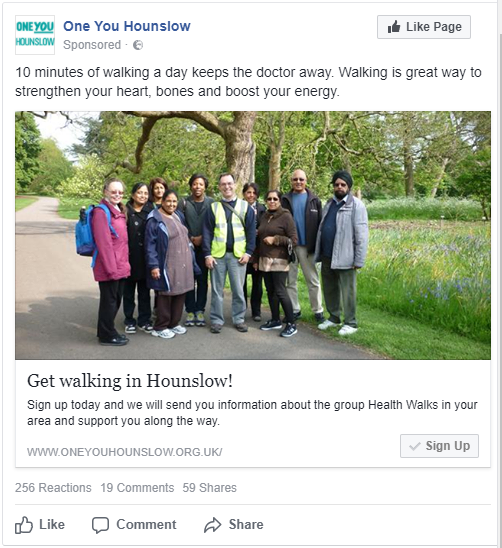 Hounslow Council wanted to raise awareness of the local parks, walking routes and groups among the residents and get them walking, at least 10 minutes a day. To help with that they offered everyone more information about the walking opportunities in the borough. That offer became the base of the marketing campaign. They also had a bonus offer, but more about that later on. So what where the components of this 2-step process? After working with hundreds of local authorities, charities, CSPs and private fitness sector this strategy has been tested, changed, and optimised so that it’s now the #1 lead generation tool for our clients. And it all starts with Facebook… let’s dive in. So, let’s start with the Facebook ad. Single image ads advertised the offer to the target demographic: men and women aged 35 years and older living in Hounslow. In each ad set we had between 2 and 4 ads using different copy and image appropriate for each target audience. We spent £2,000 on these ads in the past 70 days and it generated 1115 leads. But let’s break that down further, shall we? It explained exactly what to expect from the campaign. The image showcased the offer and other people taking part. The copy made it really clear that the offer was free walking opportunities in the borough. After people saw the Facebook ad and clicked on it, they were then taken to a customized lead ad form, which we detail in the next section. The form had one purpose and one purpose only – to get people signed up for the offer. There were no other distractions, they didn’t have to leave Facebook to sign up and when they clicked on the sign-up button and were taken to the form their details were already pre-filled by Facebook. The only thing they had to do was to check that the details were correct and click ‘Submit’. So, let’s break down all of the things that happen after someone filled in this form (and how this process saves so much time through automation). In order for the campaign to run full force and at its most efficient level… we automate pretty much everything. That includes the automated email responders after someone opts in to receive the information. 1. The lead gets a confirmation email with the details about one of the offers they signed up for (walking routes and parks information, walking groups information, active travel information) and a link to download the free Active 10 app. That’s the bonus offer we mentioned to you earlier. 2. They get placed into one of the three 10-part autoresponder series (we’ll tell you what’s in the autoresponder later on). • The lead’s request is immediately confirmed via email, no matter the time of day, so they know everything went through. • Nothing falls through the cracks. When you use tools like Zapier, Mailchimp, Campaign Monitor etc., you’re able to make sure everyone who opts in is responded to. • It saves time. The more systems that you automate, the more you allow yourself to focus on other areas of your work. No matter what time someone filled out the lead ad form (whether at 1 AM or 3 PM), we wanted them to get a confirmation letting them know that they have registered successfully. That’s where the email autoresponder came in. 2. It used language based on behaviour change techniques. 3. It included a bonus offer – a free Active 10 app for them to track their activity. After that initial email, a series of other automated emails were sent on Day 2, Day 3, Day 7 and up to 6-month period. • How much activity is right for you? 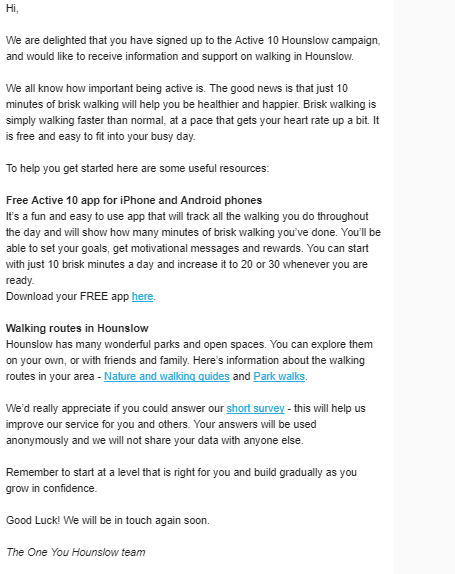 These emails ensured that One You Hounslow stayed in touch with the people who expressed an interest in walking. These emails were written using the stages of change model. So if someone didn’t get active to start with they were encouraged to do so throughout the email follow up. Once someone fills out the lead ads form, they’re instantly considered a lead and the follow up process begins. The automated email campaign helps with this as we stay in front of the lead. There’s also a good chance that the longer you wait to email someone the more they lose interest and potentially forget that they opted in to your offer in the first place. Everything you’ve done comes down to this: the follow-up and providing Value to your lead. And that is the 2-stage process!